As the leader of Hizb ut-Tahrir (HT) Britain, Abdul Wahid plays a key public relations role in Western media. He advocates HT’s position on domestic and foreign policy, including the support for political Islam (Islamism) as the solution for the problems in Muslim-majority countries. Wahid engages politicians and local authorities through speaking engagements. While it is unclear when Wahid joined HT, he has spoken on HT’s behalf since at least 2005.Houriya Ahmed and Hannah Stuart, “Hizb ut-Tahrir: Ideology and Strategy,” Henry Jackson Society, accessed February 8, 2016, 110, http://henryjacksonsociety.org/wp-content/uploads/2013/01/HIZB.pdf. In 2005, while discussing democracy in the United Kingdom, Wahid highlighted the following points to encourage British Muslims toward grassroots activism instead of engaging in the British political system. He stated in part: 1) Muslim members of parliament are “sell-outs”; 2) “religious obedience” is more important than freedom of speech; and 3) instituting Islamic values into British society would correct social problems such as binge-drinking.Houriya Ahmed and Hannah Stuart, “Hizb ut-Tahrir: Ideology and Strategy,” Henry Jackson Society, accessed February 8, 2016, 106, http://henryjacksonsociety.org/wp-content/uploads/2013/01/HIZB.pdf. Wahid has been the group’s chairman since at least 2008 when he was invited to speak at the U.K. government’s Preventing Violent Extremism program event. In the same year, Wahid spoke at a debate organized by the Cordoba Foundation.Houriya Ahmed and Hannah Stuart, “Hizb ut-Tahrir: Ideology and Strategy,” Henry Jackson Society, accessed February 8, 2016, 78, http://henryjacksonsociety.org/wp-content/uploads/2013/01/HIZB.pdf. The Cordoba Foundation is reportedly linked to the Muslim Brotherhood and Hamas.Andrew Gilligan, “Terror-link group met in parliament,” Telegraph (London), November 23, 2013, http://www.telegraph.co.uk/news/uknews/terrorism-in-the-uk/10470307/Terror-link-group-met-in-parliament.html. HT Britain is one of the organization’s most active chapters. Analyst Zeyno Baran called it the “nerve center” of the movement.Zeyno Baran, “The Challenge of Hizb ut-Tahrir: Deciphering and Combating Radical Islamist Ideology,” Center for the National Interest, September 2004, xiv, accessed June 3, 2015, http://www.cftni.org/Program%20Briefs/PB%202004/confrephiztahrir.pdf (page discontinued). Past members of HT Britain have been linked to ISIS and other extremist groups.Sara Malm, “100 Members of Controversial Islamic Group Linked to Radicalised British Students Including Jihadi John Have ‘Joined Forces with al Qaeda in Syria,’” Daily Mail (London), April 11, 2015, http://www.dailymail.co.uk/news/article-3034733/100-members-controversial-Islamic-group-linked-radicalised-British-students-including-Jihadi-John-joined-forces-al-Qaeda-Syria.html. 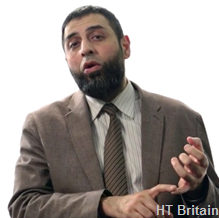 As the leader of Hizb ut-Tahrir (HT) Britain, Abdul Wahid plays a key public relations role in Western media. “Had any government in the Muslim world taken a robust stand on the on-going insults to the Prophet – peace be upon him – threatening diplomatic action or to cut trade relations over the insulting depictions – I do not believe individuals would feel the frustration to retaliate.”“Dr Abdul Wahid On The Recent Events In Paris,” Hizb ut-Tahrir Britain, January 8, 2015, http://www.hizb.org.uk/current-affairs/dr-abdul-wahid-on-the-recent-events-in-paris. “Alhamdulillah, things have changed a lot and are still changing. The fear factor in Tunisia, Egypt, Libya and much of Syria has gone. People have stood up, spoken out and three major tyrants have fallen in humiliation. The sentiments for Islam, so long suppressed, are loud and clear.”“Interview: Dr Abdul Wahid of Hizb ut Tahrir on the Arab Spring,” 5Pillars, April 29, 2013, http://5pillarsuk.com/2013/04/29/interview-dr-abdul-wahid-of-hizb-ut-tahrir-on-the-arab-spring/. “Western governments will never admit that their repeated interventions trying to ‘fix’ what they themselves have broken only creates more problems. They show no signs of wanting to leave the Muslim world to shape its own future and political destiny. Stability can only come when a system of government enjoys the trust and confidence of the people and that will only come when Islam lies at the heart of the system.”Abdul Wahid, “Why Britain’s Afghan Venture has Failed,” Dr. Abdul Wahid’s Weblog, December 12, 2007, https://drabdulwahids.wordpress.com/2008/03/09/why-britains-afghan-venture-has-failed/.